Giraffe calf Misawa browsing. Photo by Dennis Dow/Woodland Park Zoo. Giraffes are the tallest browsers in the world, reaching up to the tip-top of acacia trees on the African savanna. The acacia leaves themselves are packed with water, so the giraffes can go a long time without drinking. 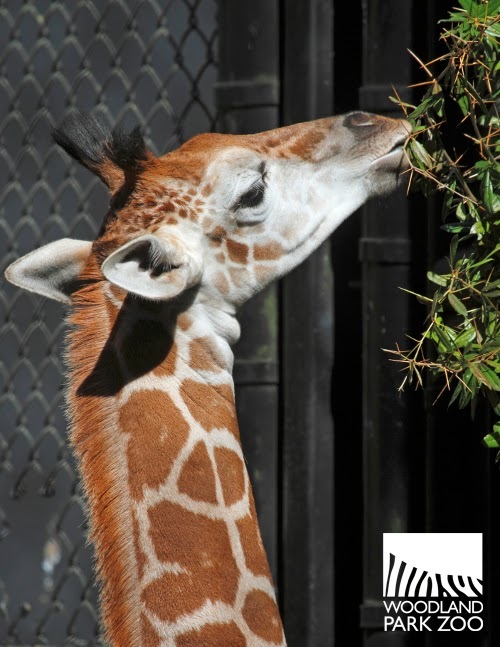 In the wild, giraffes spend most of their day nibbling on these leaves, a slow process because they can only grab a few leaves in each bite. They can eat up to 75 pounds of leaves in a single day. That is a lot of browsing! At the zoo, keepers provide our giraffes with special, sky-high enrichment in their indoor barn to encourage their browsing instinct. We stopped by the giraffe barn on a soggy spring day to check out some of their indoor activities. Video: Giraffe enrichment at Woodland Park Zoo. Produced by Kirsten Pisto/Woodland Park Zoo. If you look closely you can see the sticky saliva that assists the giraffes in coating any thorns they might swallow, allowing them to digest the prickles without injuring their gut. Their tongues are extremely dexterous, able to reach the most elusive leaf. You can see they are a dark color too, helping protect the tongue from harsh sunlight; after all it is exposed for a majority of the day. Our three giraffes, including baby Misawa, spend some of their time indoors when it is very rainy. The majority of their time is spent outdoors on the savanna with zebra, ostrich, gazelle and oryx. Giraffes at Woodland Park Zoo dine on acacia leaves, hay, carrots, lettuce and special biscuits. Want to make a people version of giraffe enrichment? Try this giraffe-inspired summer salad recipe! Stir together dressing ingredients, be sure to crush the cilantro and pepper (using a mortar and pestle if you have one). Toss the mix over the salad. For a real giraffe enrichment experience, you can place the salad in a tree, but we recommend finding a sunny picnic spot instead. Enjoy!